Three Historic Buildings in Kerrville's Main Street District. Two of which have just received Texas Historical Markers. 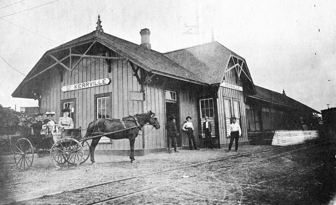 The San Antonio & Aransas Pass Railroad made Kerrville the last stop on its rail line in 1888. Frank J. Beitel bought land along the tracks to establish his lumberyard at 425 Clay Street, now serving as Rails Events Hall. In 1913, the original passenger depot burned down. Mr. Beitel sold a piece of his land to the SA&AP to build a new masonry depot in 1915. This structure is now Rail's a Cafe at the Depot. In 2011, a building slated for demolition was moved from 433 Water Street to the property. Originally built by James Spicer c.1884, it sold in 1896 for use as a mercantile. The structure now houses the Shops at Depot Square. These historically significant buildings have been respectfully restored. In the process we are learning about the people who built, lived, and worked in them and how they helped Kerrville grow. These structures still stand and continue to serve our community. We hope you will enjoy learning more about them. The San Antonio & Aransas Pass Railway was incorporated in 1884. As president of the railway, Uriah Lott had his eye on a northwest expansion. A committee headed by Captain Charles Schreiner made sure that Kerrville, with a population of approximately 300, was chosen over Fredericksburg. "The tracks reached Kerrville in September and on October 6, 1887 at 11:45 an excursion train of six new coaches rolled into the city. It had left San Antonio with over 200 persons aboard and picked up about 200 more along the line. It was greeted with hearty cheers and a slute of seven guns with music furnished by a brass band. A large barbecue was prepared with the roasting of fourteen beeves, twenty sheep and a number of goast." 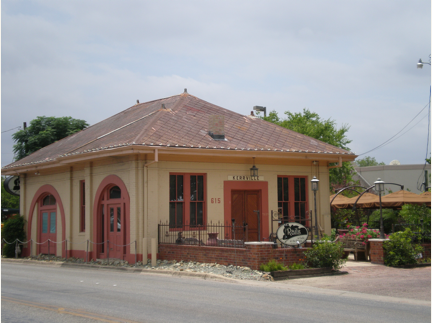 Kerrville was the last stop on the narrow gauge SA&AP Railway, with a roundhouse built at the nort-east corner of Paschal and Schreiner Streets to turn the trains. We have been told by several people that kids, when they heard the train come in, they would run to the round house and actually help turn the train around!